Team building can happen anywhere. So whether your next meeting is in the dead of winter or heat of summer, indoor team building is always an option. Looking to grow and develop members of your organization? Team building activities are a great way to engage current employees and develop deeper relationships so they can work better together. When these relationships grow, the better creativity, productivity, and quality work is produced. If you’re not consistently team building, now’s the time to start! Moreover, fun team building activities can happen anywhere, not only outside during the warm summer months. Below are six indoor team building activities to try to boost engagement and increase connections. Looking to bring out the fun and competitive spirit among coworkers? Game Show Feud is a team building activity with a real game show atmosphere. After the initial icebreaker, participants will face-off at the podium, where they will compete to take control of the game. The system uses a fast-paced round of survey questions with a bracket scoring system. The winning teams move through the bracket to the finale. Best of all, our unique game show design helps keep everyone involved during the show, including polling the audience. 2. A Minute 2 Win It! Using everyday household items and office supplies, A Minute 2 Win It! is a series of high-energy tabletop team building games. After a demo and practice session, teams will compete in fast-paced challenges and be scored accordingly. Teams will be assigned to an activity station and rotate through the various challenges. In addition, teams are always engaged and focused on continuous improvement in an attempt to maximize their score. Examples of challenges include: tossing and catching an ever-increasing number of pencils, cup stacking, racing to put a shuffled deck of cards in a specific sequence and more! Want to know how each coworker works best? Our MBTI training helps teams determine personality preference through a Myers-Briggs Type Indicator assessment as well as how to enhance team dynamics through the data collected. This training workshop will help teams understand each other’s personalities better and how this awareness can translate into positive behavior and address differences respectfully and productively. The workshop will also explain thinking, organization, and decision-making associated with each personality style to help develop better communication preferences with employees. Teams then work to create a company name, design a logo, create menus and a commercial to perform and lastly build a large, cardboard truck facade. Then, teams will be provided with specific ingredients to make a dish for everyone to try. The catch? No recipes will be given, and teams will have to work together to create a tasty dish all on their own. Teams will try to out-cook one another and out-score their competition to win gold medals. Best of all, teams will be able to graze the room and see their competition’s food trucks and try their tasty dishes. This is a great indoor team building activity that also allows employees to give back to the local community. 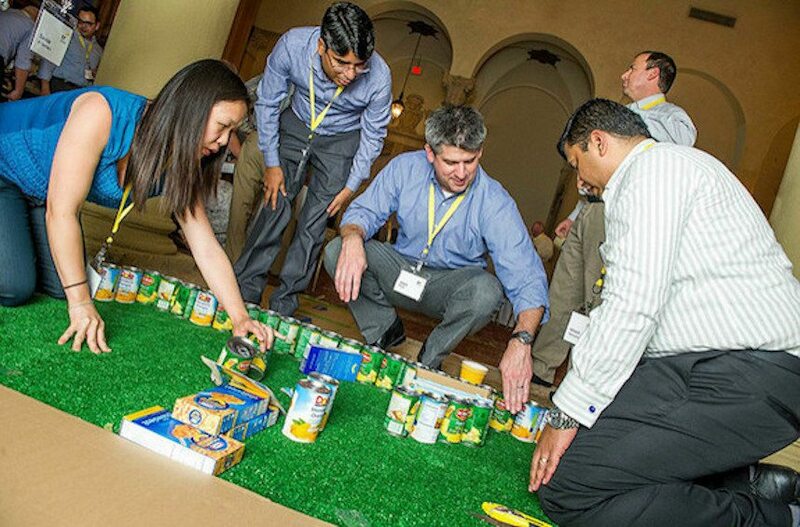 Participants will form groups and have to design and build a unique, one-of-a-kind mini golf hole with donated food items and ultimately, create a miniature mini-golf course. Green carpeting is provided as well as canned goods, boxed goods and other building materials. From concept to construction, participants will work together to create not only the course but rules for their hole. Once each hole is designed, and the rules are explained, everyone in the group gets to golf the course. In the end, the team will combine individual scores to determine which team will be crowned mini golf champion! After the competition, the canned food items will be boxed and delivered to a local food bank. Or, if possible, a local representative from a food bank/organization will address your group and thank them for their generosity. In this indoor team building activity, participants will design and build various themed structures utilizing candy and chocolate delicacies. Teams can choose to build famous landmarks from around the world, including the Golden Gate Bridge, Colosseum, Eiffel Tower, etc. Furthermore, participants will earn points for their team using iPads which deliver text, audio and video clues, chocolate trivia and exciting gaming challenges. With these points, teams will purchase a chocolate construction kit and their special materials package to build their structures. Regardless of your meeting venue, we can assure you indoor team building can be just as fun as outdoors. From a small intimate group of 30 to a large group of over 100, our events at Best Corporate Events focus on interaction which leads to happier and more productive team members in the workplace. Better yet, we work seamlessly with your venue to arrange all the logistics, setting up the materials and getting the room ready for the activity.